I'm happy to announce that my second FM, Breathing Corpses is finished and ready to be played. This is a rather long fan mission with undead, old tombs and hammerites; I drew inspiration from Bonehoard and Return to the Cathedral. Make sure to read the mission's description thoroughly before you jump right in, as you may miss something important. Have fun! This fan mission is rather large, so as gnartsch suggested you'd better write down notes of whatever seems peculiar to you, in order to prevent too much backtracking! * both bugs seem to have appeared with the previous update, my apologies. Please, don't hesitate to PM me anything looking suspicious. I also forgot to mention, thanks a bunch to shadowbox for contacting me and offering to translate the mission! Thanks to Overmann, MoroseTroll, fortuni, Athalle, Zappenduster, Azaran, Marbleman and H3H3, the mission is available in German/Italian/Russian/French and English of course (thanks again for your work on such short notice). The intro cutscene is in English only. Welcome, taffers, to Bonehoard on Steriods! This is an absolutely awesome mission for those who like exploring ancient crypts full of undead. 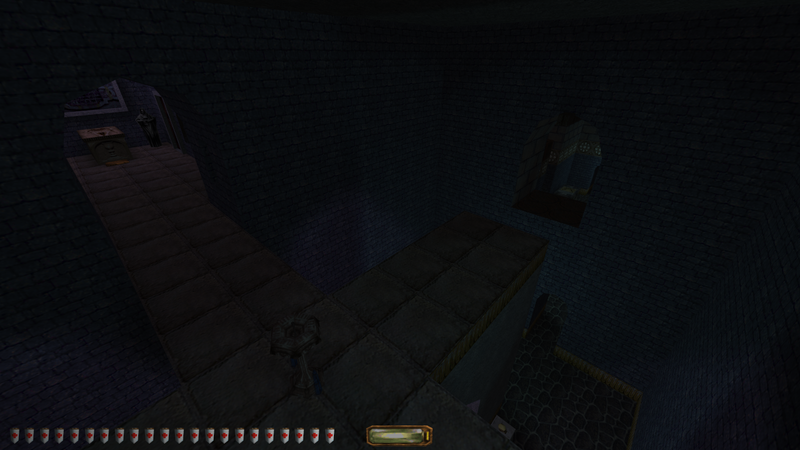 The use of mostly stock textures coupled with some very bizarre architecture makes it feel like a level made by LGS. No joke. Nice, just in time for the weekend, and congrats on the release FrenchDecay! Another Bonehoard-ish mission. We crypt lovers are taking over! Wohoo, it looks like another bonehoard mission! Downloading right now. Finished! Took me 2 and a half hours and got ~14K Loot. I'm speechless. This was a true masterpiece. 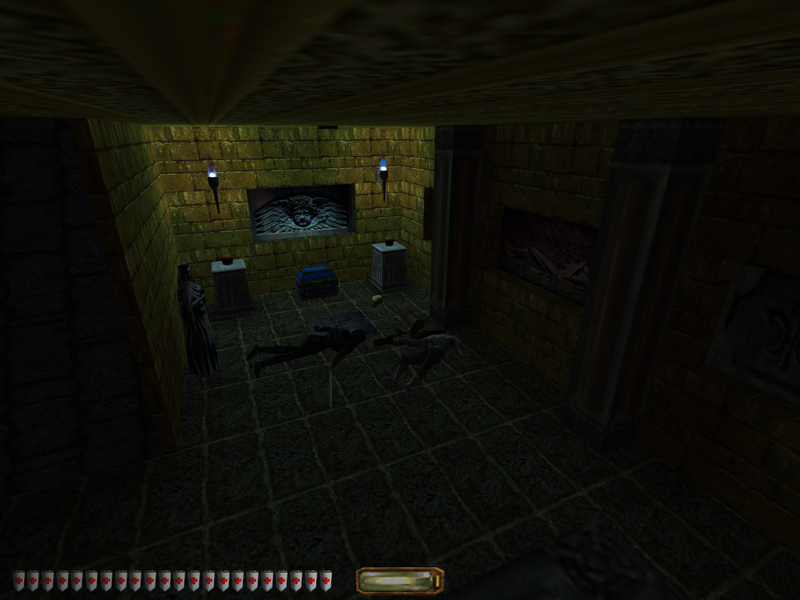 I especially loved the use of Thief 1 OST and stock textures. Was perfect. Other than that, thanks a bunch for playing, and thanks to the other players too! Sneaky Reminded me of Deceptive Perception. # 1 Where is the rosary bead? According to the notes it should be near the heart of the deceased hammerite high priest. # 2 I found the Hammer Stem - where is the hammer head located? # 3 For which door is the "key to a strange place" for? I can´t find the matching door. # 4 I have found two goblets until now. What do I do with these? # 5 There is another riddle containing the three brothers and their father. I assume I have to put a special item on the correct pedestal, is this correct? If not, how do I solve the puzzle? I was just checking the forum to see today's posts and what a great surprise. Thanks FrenchDecay. Look for the hammer symbols the dead thieves mention. Eventually you'll uncover a door, the key you have unlocks it and that's where you find the Rosary. A lot of pedestals in this FM take specific items. Take a look around and see if you can't find a place where two goblets would be in the right place. I'm stuck as well on the other two items. #I have a Dirty Key, a Sweaty Key and a Breathing Key, but no idea where to use them. # There are four chests in the large hall where the Hammer Haft is located that I can't open. # How do I cross the room where the Hammer shadow is on the floor? # There's a open tomb in the Ossuary that I can't reach (I get the feeling that I shouldn't have taken the Golden Skull underneath). Is there something in there? Q: I found the Hammer Stem - where is the hammer head located? Q: There is another riddle containing the three brothers and their father. I assume I have to put a special item on the correct pedestal, is this correct? If not, how do I solve the puzzle? A: Yes, it is correct. Q: I have a Dirty Key, a Sweaty Key and a Breathing Key, but no idea where to use them. There are four chests in the large hall where the Hammer Haft is located that I can't open. A: These keys should open those chests. Q: How do I cross the room where the Hammer shadow is on the floor? A: Have you been to the library and read a "special" book? Q: There's a open tomb in the Ossuary that I can't reach (I get the feeling that I shouldn't have taken the Golden Skull underneath). Is there something in there? A: You can rope up the pink texture. Three brothers riddle.Where can i find food and wood? I found 3 pedestals with "how heavy" description.What is all about? Yes I've have been to the library and read the words of the Builder, but I still can't cross the room. I have the Rosary and the Hand of the Saint as well. Am I missing something, or could this be a bug? EDIT: Figured it out. Forgot that old trick. The keys did open the chests - I tried using all three keys on just one of the chests...the one that requires the fourth key, of course. EDIT: Disregard the face part. I may have discovered a bug - You can use Mortuary Coins on "the Saint" and he just gobbles them up. Last edited by Unkillable Cat; 1st Apr 2017 at 21:07. You're thinking this one wrong. You need to find one item and place it on the correct pedestal. The pedestals in the room are weights. Try placing something heavy on them. I just wanted to mention that when I received the objective to reassemble the hammer. The new objective chime did not show until I opened the chest across from Carcass's vault. I'm not to keen on zombies, but I'm looking forward to playing this one. The coins may also vanish when used on doors or chests. Furthermore, something with the "kill 30 enemies" objective isn't right - it ticks off when far less than 30 have fallen victim to me. corpse0.str and corpse1.str only exist in the german and italian translations. Are these just leftovers? Some sound files (e.g., EvHaLa0.wav and EvHaLa1.wav) exist in more folders than necessary. Awesome mission, definitely a permanent keeper and will be replaying in the near future. Didn't use the forums to find stuff so it took a little longer to complete than I initially anticipated. The winding and inter-connection level design is great and definitely takes more time than usual to memorize it. Great work FrenchDecay! Last edited by Corsair; 1st Apr 2017 at 23:08. Where is the rosary bead? According to the notes it should be near the heart of the deceased hammerite high priest. I found the Hammer Stem - where is the hammer head located? For which door is the "key to a strange place" for? I can´t find the matching door. I have found two goblets until now. What do I do with these? There is another riddle containing the three brothers and their father. I assume I have to put a special item on the correct pedestal, is this correct? If not, how do I solve the puzzle? The hammer head is located in the room on the right, high up once you get past the Rotten Sun and the room with the hammer shadow. To get past the room with the hammer, you will need to go read some grave wardens' books in order to know how to get past their "security"
The Justice shrine contains a puzzle with three pedestals : this is the only puzzle who doesn't require specific items, anything having weights can be used; for all other puzzles, the items will stick to the pedestals automatically. Rosary bead : You will find the Rosary bead in the room right before the funeral home, look behind a pillar on the left and use the hammer replica on the slab to unlock a passage to a door on the ground, there you will need to use the key to a strange place! 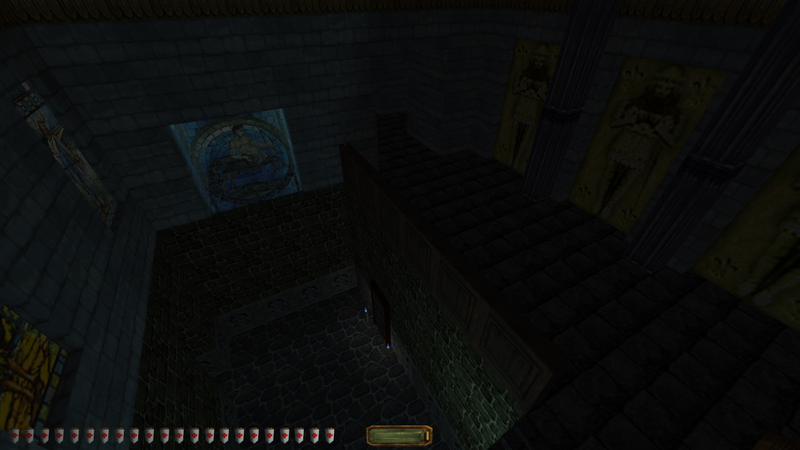 The goblets go on the pedestals you'll find in Lud's vault, near the start (see the goblet texture on the wall), if you come from farther down the tombs you can rope up some beams. stand at the bottom of the stairs and rope up the gargoyle on the right. To get past the hammer, you need to jump there and time it well in order to get to where the shadow is, it's cast by an invisible hammer icon floating in the middle of the room. You need to read a book from the library in order to go unnoticed and unhurt (listen for the holy water effect to know you're good to go). For the 3 sons' puzzle, here is the solution. You will need to obtain the Old Man legacy (to do that, mirror the rooms near the chapel behind the library, theirs doors open once you meet the old man in the room near the Nave, up from the Justice shrine). You will need to use the legacy on the correct pedestal. The third son is the good son. Ravenus, where were you and what were you doing at that moment? Did you hear the icon speaking to you?